It’s a time for pastels, eggs, flowers, and cute bunnies! Bring the holiday to life with these 17 Easter Bullet Journal Ideas and themes. I want to make a quick disclaimer, other than the affiliate disclaimer above. Easter is traditionally a religious holiday. However, this post is geared more towards the consumer Easter theme. If you prefer to keep the holiday in faith, there are some wonderful ideas on Pinterest for bible verses and faith inspired doodles. Also, I found this Free Easter Brush Lettering Practice Sheet featuring Matthew 28:6. I think this would look beautiful as a cover page for April. Growing up, Easter was one of my favorite holidays. It wasn’t quite on the same level as Christmas, but it ranked higher than Thanksgiving and New Year’s Eve. Back then it was the egg hunt and the little surprises in my Easter basket. But as an adult with a severe marker addiction and doodle habit, it’s the best time to bust out all of my Pastel Tombow Dual Brush Pens and go crazy. Do you think I should go with an Easter theme for my April bullet journal setup, or something totally different? Let me know in the comments! I’ll be filming my Plan With Me Video soon. 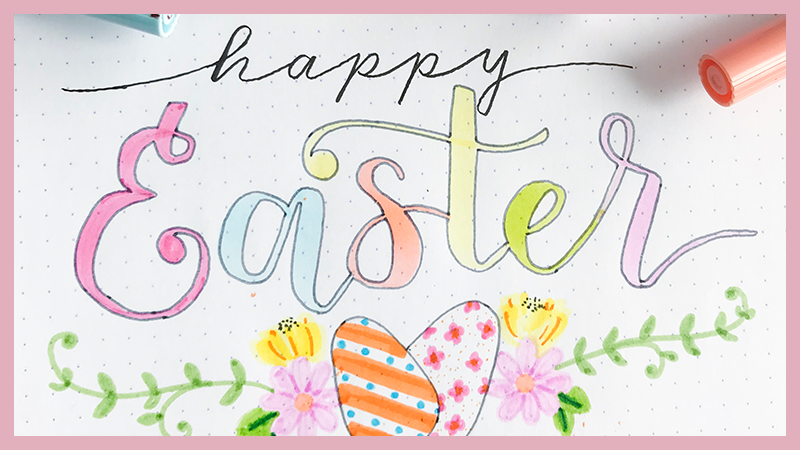 In this post, I will be sharing 17 Easter Bullet Journal Ideas from talented and creative bullet journalers (is it journalers or journalists?) in the community. Also, I’ve included some of the cutest stickers, stamps, and washi tape rolls to help you decorate your journal with ease. Want to learn to doodle before setting up for April? It’s a perfect time. 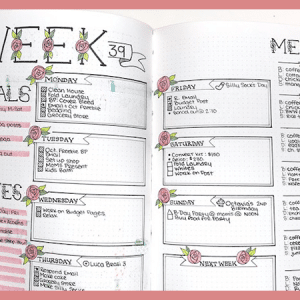 Check out my 30 Days of Bullet Journal Doodles YouTube Series and grab the free printable workbook in this post. 1). Pastel Tombow Dual Brush Pens: These are by far my favorite markers for this time of year. They are perfectly pastel and the dual tip makes them multi-purpose. 2). Pastel Washi Tape Bundle: These are perfect for jazzing up the edges of your pages and adding a pop of color. 3). Pastel Dot Stickers: These are perfect for daily tasks and events throughout the month of April. Each sticker is 5mm and you can write over them. 1). Rose Gold Bunny Washi Tape: How stinkin cute are these little rose gold foil bunnies? 2). Black and White Easter Egg Washi Tape: This set of washi tape is perfect for adding some Easter spirit to your bullet journal. You can color in the eggs yourself, too. 3). Easter Sticker Sheet: These cute little bunnies and pastel florals are the perfect addition to your Easter themed spreads. 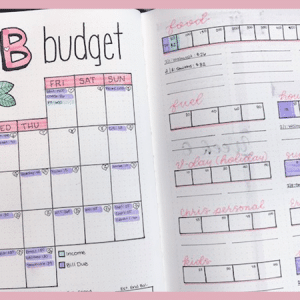 Take inspiration from these 17 Easter Bullet Journal layouts, but be sure to credit the creator if you decide to recreate any of them. Not everyone celebrates Easter, or maybe you just aren’t feeling the pastel colors and fluffy bunnies this month. That’s okay! You don’t have to go with the flow. Here are some other bullet journal themes to consider for April, based on national holidays. Again, you don’t have to use any of these themes. You don’t have to have a theme that is based on a holiday or a season. However, sometimes looking at lists of holidays or thinking seasonal can make the challenge of finding a theme a lot easier. I have an entire post dedicated to 12 months of Bullet Journal Themes if you are feeling stuck or need some inspiration. What themes do you currently have in mind of April? I always have a printable monthly kit released around the 20th of each month. What theme would you like to see in the printable shop for April? Please, take a moment and Pin the Image below to your favorite Bullet Journal Board on Pinterest. Share the love with others who may be struggling to find a theme or ideas for April.